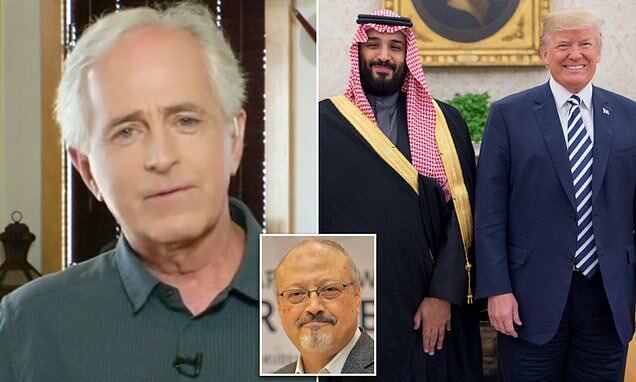 Tennessee Republican Senator Bob Corker says the United States must impose sanctions on Saudi Arabia over the murder of a journalist, if it is revealed that the Crown Prince had him killed. Corker admitted however, that the US faces a delicate situation in taking any punitive measures, should it be revealed that journalist Jamal Khashoggi was murdered by Saudi Crown Prince Mohammad bin Salman inside of the country's embassy in Turkey. 'Obviously, if he's gone forth and murdered this journalist, he's now crossed the line, and there has to be a punishment and a price paid for that,' the Senate Foreign Relations chairman said Sunday on CNN's State of the Union. While Corker said he does believe that Khashoggi, a Washington Post journalist, was 'purposefully murdered' in a Saudi operation directed by the Crown Prince, he says he still wants to see a completed investigation. The Saudi's official story behind Khashoggi's killing has changed drastically in the weeks since he first disappeared in the embassy on October 2 after going inside for paperwork to marry his Turkish fiancee. On October 4, Saudi government officials said he had left the consulate through a back door. Eventually it became clear that he never walked out. On October 19, the next story was that he was killed fist fight inside the consulate. President Trump said earlier this week 'Their stories are all over the place,' about the Saudi government's varied claims as to how Khashoggi died. 'I don't think anybody believes that story,' Corker said of the alleged fistfight in the embassy that the Saudi government is spinning.